Natural coconut oil benefits include numerous health and anti aging skin care benefits. 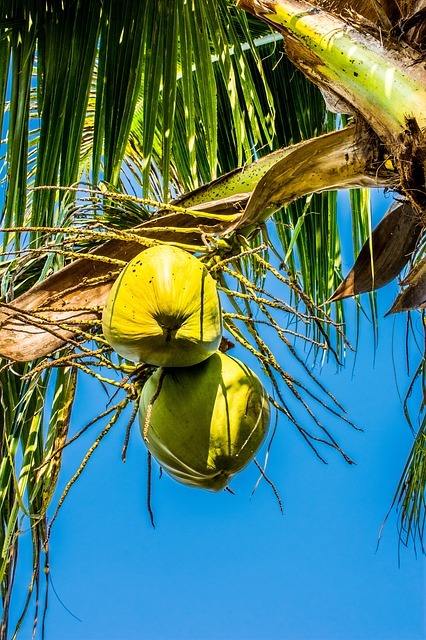 The coconut healing powers and its ability to nourish the skin with its antioxidant properties has been practiced for generations and are still popular today. The beauty of many islanders flawless, creamy complexions and long lustrous hair can be attributed to a healthy tropical diet as well as including this amazing oil in one’ beauty regimen. The oils high level of antioxidant protection helps prevent the destruction of aging and fight free radical formation both when used topically and internally. Free radicals harm the skin and speed up the aging process causing dryness and flaking, wrinkles, loss of elasticity, age spots, uneven skin tone, and dull complexions. This oil makes an inexpensive replacement for chemical-added beauty lotions. It has the ability to act as a protective barrier, absorb quickly and give you an immediate healthy glow. Coconut oil’ nutritional content of medium-chain fatty acids (MCFA’s) and being rich in Lauric Acid and Vitamin E enriches and supports the health of skin by protecting and strengthening individual cells. Keeping connective tissues strong and supple will help prevent sagging skin and wrinkles. The unique low molecular weight of this oil is important for the ease of penetration. Easy absorption makes it perfect to deliver hydration where it’s needed to keep skin supple. Surprising as it may sound this unique oil is a highly effective cleansing system and makeup remover. This method of cleansing will protect the skins delicate moisture balance while removing impurities and makeup. It also helps provide added protection from the damaging effects caused by overexposure to the sun’ ultraviolet rays and can be used as an after-sun treatment with no oily after-feel. This powerful oil contains strong antifungal agents that can also be helpful in improving the symptoms and treating infections such as common cuts, scrapes, blemishes, yeast/ fungal infections, eczema, dermatitis, and chronic psoriasis. Various products are made with this healthy oil in them such as beauty oils, soaps, face creams, body lotions, lip balms, sun screen lotions, and hair products. Coconut oil for skin offers wonderful moisturizing properties. It makes a perfect choice for a soothing and relaxing massage oil, leaving you feeling revitalized. It will improve circulation and alleviate muscular pains. The tropical pleasant aroma and soothing massage movements helps in stress relief. Coconut Oil Benefits For Acne- Coconut oil helps reduce redness, destroy the acne causing bacteria on the skin, and keeps pores clear and unclogged. It contains two of the most powerful anti microbial agents (Capric Acid and Lauric Acid) to help maintain an anti- acne environment. Coconut Oil Benefits For Dry Rough Skin – An excellent moisturizer will keep your skin moist, shielding from moisture loss. The components of coconut oil remove dead layers, relieve dryness and flaking, and encourage growth of new, healthier tissue. Use as an over-night sock treatment for cracked feet. Coconut Oil For Hair Care-An excellent beauty and hair care product that can provide the much needed moisture to the scalp and hair and help protect against hair damage, dandruff, and scalp flaking. This oil serves as a deep conditioner treatment to help restore protein loss for dry and damaged hair cuticles. Treatments nourish each strand adding strength and reinforcement to prevent hair breakage and promote hair growth. The rich value of coconut oil is not limited to topical use. It's also a healthy addition to your diet. There are many health benefits of coconut oil that has been uncovered. Its many health giving properties work just as hard internally supporting your immune system, improve energy levels, reduces inflammation , supports tissue healing, relieves constipation, improve digestion and maintain cholesterol levels. It has the ability to help protect your body against heart disease, diabetes, HIV and cancer, liver and kidney diseases, and osteoporosis.